Healthy smoothies for weight loss! What could be better? Smoothies are an amazing and delicious way to cool down on a hot day and to satisfy those cravings for something sweet! The only downside is, smoothies are so often made with lots of sugar which is a huge no-no for weight loss. But that surely doesn’t mean that you can’t have any smoothies or anything delicious while losing weight! It’s time to get rid of the understanding that weight loss automatically means bland, gross, tasteless food and saying goodbye to any enjoyable meal until you shed those pounds. There are so many diet-friendly healthy smoothies for weight loss out there! 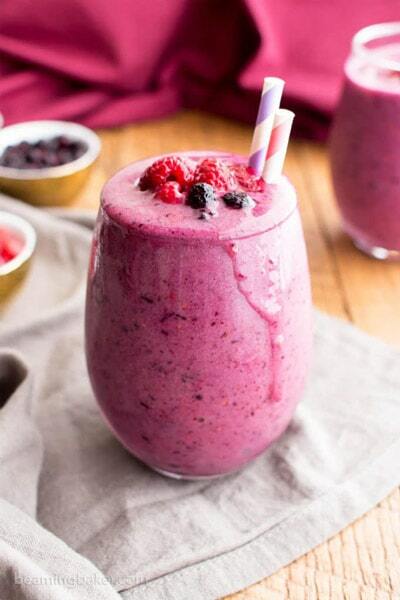 And what could be better than enjoying a delicious smoothie while also losing weight at the same time? If you don’t know much about how to make a smoothie, don’t worry! Each recipe is very thorough and tells you precisely how each one of these drinks for weight loss are made! Well, keep on reading to find out some of my personal favorite healthy smoothies for weight loss! I don’t know about you but I absolutely love key lime pie! Who am I kidding, everyone loves key lime pie! 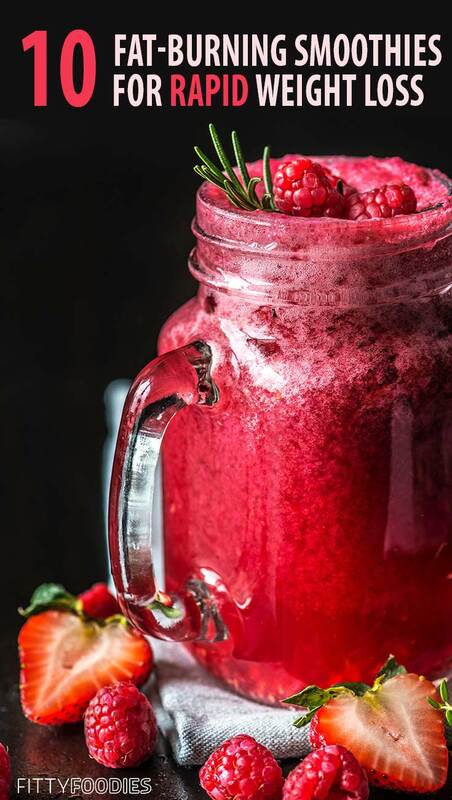 And what could be better than being able to enjoy this delicious dessert in the form of a healthy drink while losing weight? 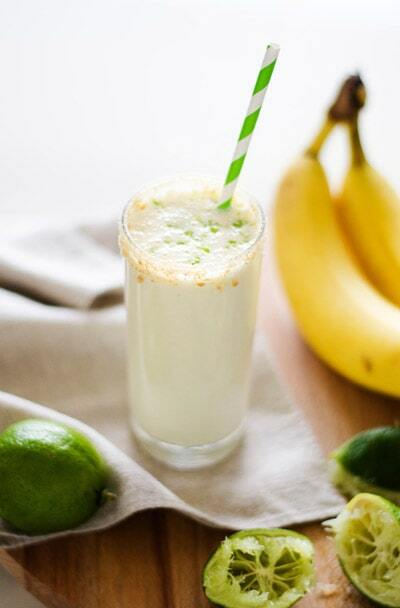 This smoothie consists of some non-fat greek yogurt, banana and, obviously, lots of lime juice among other ingredients. 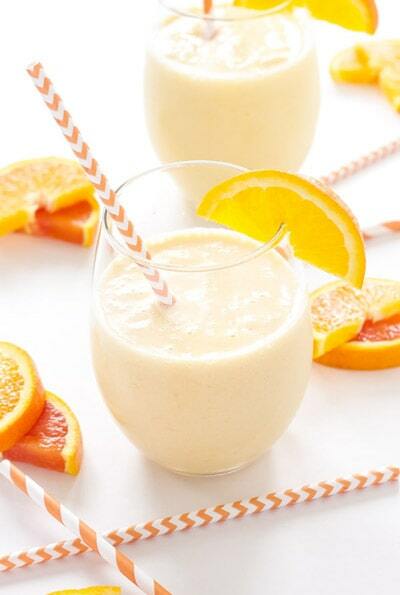 I recommend this smoothie if you enjoy creamy and citrusy desserts. It will surely satisfy your cravings and give you lots of energy! Another creamy delight! 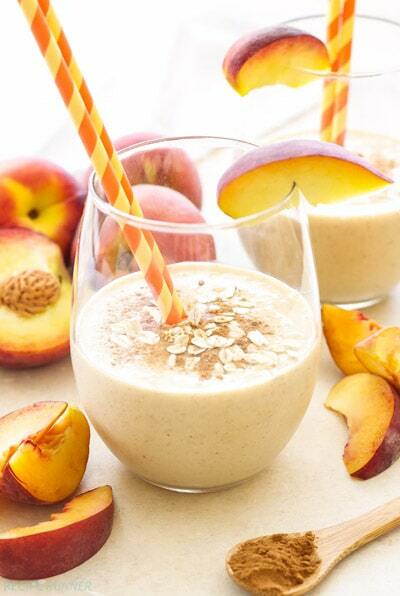 This peaches n cream smoothie tastes just like peach pie! Made with some oats, greek yogurt, and lots of peaches, this is the perfect meal to start off your day, to get ready for your workout, or to coll down on a hot day. Remember those delicious orange creamsicles that you’d buy from the ice cream truck in your childhood? Well, this smoothie is like a trip down memory lane because it tastes pretty much the same! Another imitation of one of your favorite childhood desserts! This nutritious, fruity and peanut buttery drink is the perfect quick breakfast or pre-workout meal. There’s been huge hype about green smoothies lately… and not without reason! Green smoothies are absolutely delicious, look beautiful and have lots of vitamins from the greens and fruits in them. Here’s a delicious, refreshing, dairy-free strawberry-blueberry-raspberry smoothie rich in antioxidants! This smoothie is perfect for cooling down during the summertime or just for a quick meal on-the go. 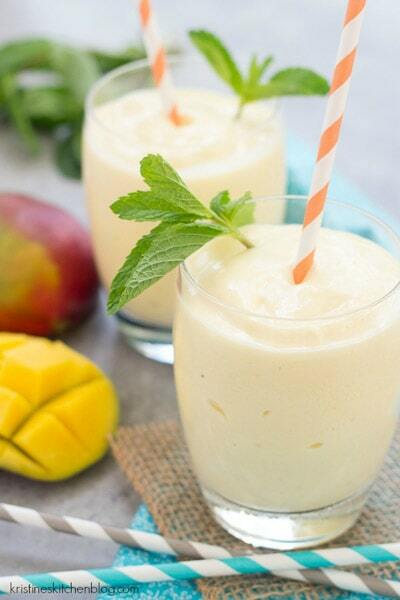 This creamy, dreamy mango smoothie is absolutely delicious and perfect for satisfying those annoying sugar cravings! It’s surely one of the tastiest healthy smoothies for weight loss! I’m sure a lot of you love banana bread and are now trying to avoid it due to weight loss. 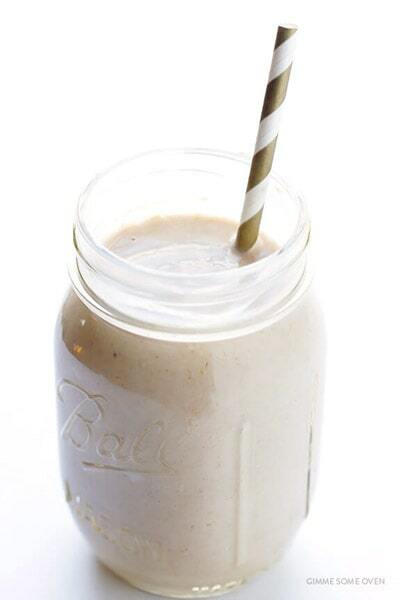 Well, this delicious weight loss-friendly banana bread smoothie features features the amazing taste of fresh, soft and sweet banana bread, making it one of the best weight loss shakes tastewise! Ahhh… pumpkin pie. Probably the most delicious dessert of autumn. 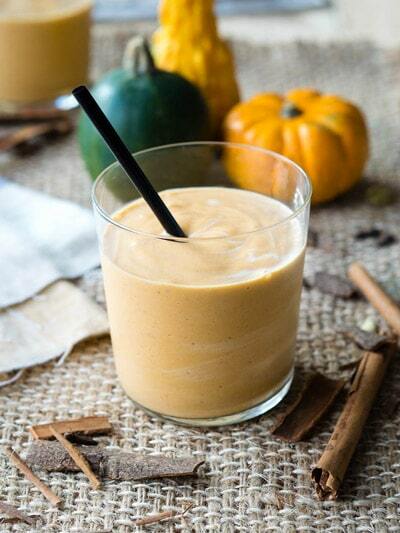 This pumpkin pie smoothie is super easy to make and tastes just like the famous dessert! That’s why it’s one of my favorite healthy smoothies for weight loss. Full of vitamins and nutrients, this is the perfect way to start of your day or to have a quick meal in between daily activities or before your workout. 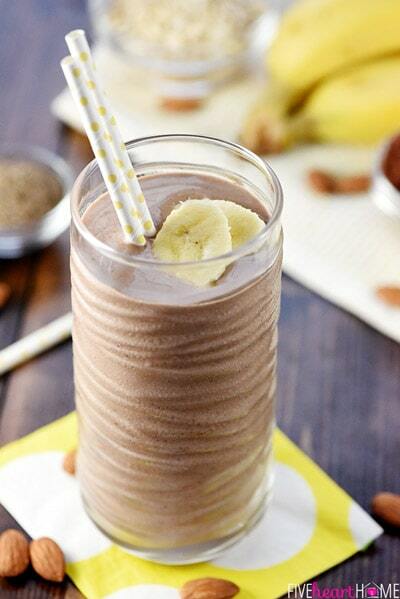 In this recipe, unsweetened cocoa powder, almond butter, and bananas are brought together to create the perfect weigh loss breakfast or snack! Filled with protein and vitamins, it will surely get you pumped for the day and provide you with lots of energy, as well as satisfy your sweet tooth or chocolate cravings. So there you have it! These were some of my favorite healthy smoothies for weight loss which I love to have even when I’m not on any diet! They’re guilt-free, delicious and filled with lots of protein, healthy fats, vitamins, and fiber. After reading this article, you are probably relieved to know that there are so many delicious alternatives to some unhealthy snacks or smoothies! 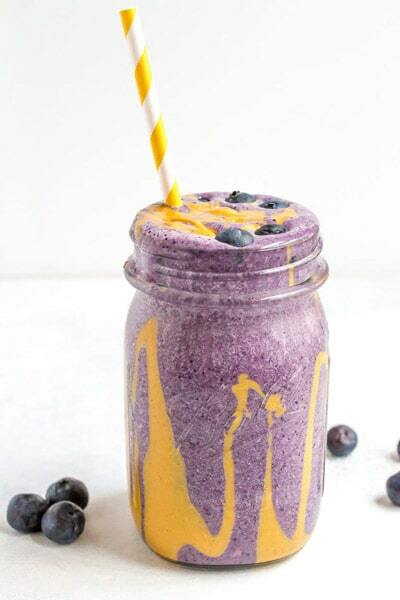 However, it’s important to know that most of these smoothies have lots of carbs in them which means that the best time to consume them is in the morning or before your workout, NOT IN THE EVENING. 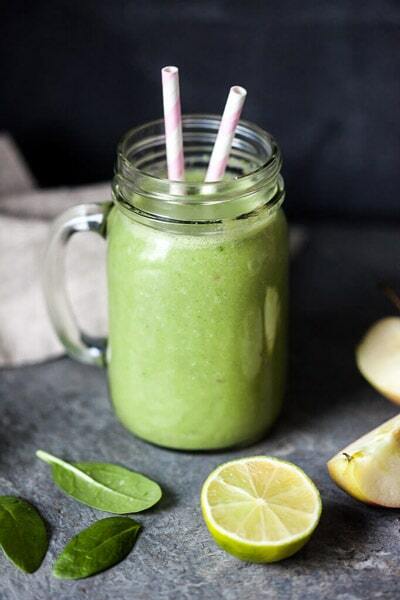 If you have the right amount of these healthy smoothies for weight loss at the right time and combine them with other healthy eating habits, you’ll be sure to succeed in your weight loss journey! 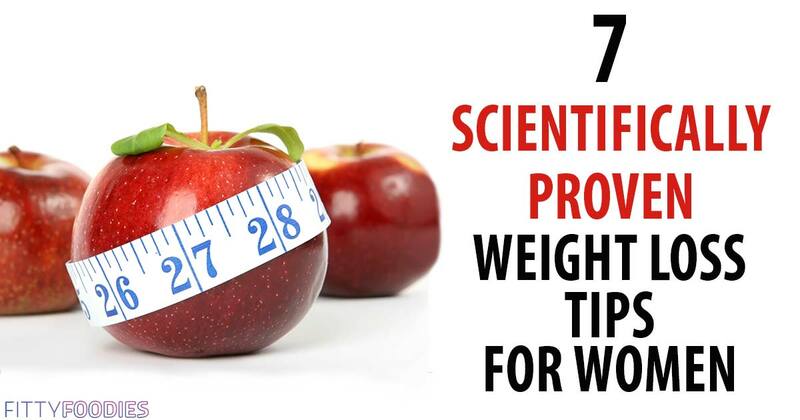 Attention if you want to lose weight! However, if you don’t know much about weight loss and diets, we recommend investing in a weight loss diet which will definitely be a huge help and will give you many useful weight loss tips. Not to mention, you won’t have to waste your time searching for weight loss info online because you will have it all in one place! We recommend the 15 Day Di.et Plan which will tell you step-by-step how to succeed in weight loss! If you follow this program, you could lose up to 15 pounds in just 15 days! Not only will you look skinnier but you will also feel noticeably better, you will get rid of those annoying aches and pains all over your body and you will take a huge step towards a happier and healthier you! So, what’s it going to be? Will you continue putting off weight loss or will you finally invest in a skinnier and healthier body? Click here for a detailed review of the 15 Day Diet Plan and what to expect from it!